- presentation and introductions to the universe you share to friends to make them discover B5 ! Finally, "Theories" an evolving section with articles on the biggest mysteries of B5 Universe. Every 1-2 months, a new article covering different subjects will be released. - being a French native speaker, my written English is unfortunately far from perfect ! I still decided to do the website in English to touch a large audience of B5, but still, I am very sorry for it and will continue to work hard to improve it ! Last edited by Apsu; November 21st 18 at 19:28. Visitors from Down the Street. 13th May - 14th May 2267 (On screen date). Each Night I Dream of Home. May 2267. (The Medbay scene between Lochley and Gideon was originally going to be their first “formal introduction”. 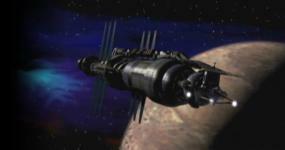 With the subsequent change in the production and the running order this scene was redubbed slightly, however considering that the Excalibur had been to B5 recently [Racing the Night] it's logical to assume that they met, however briefly there, as Gideon had his meeting with General Miller and the Ambassadors. Lochley being injured in the Raider attack and then meeting Gideon “again” on the Excalibur becomes their first “on screen” meeting). That's a pretty site, Apsu! Very visually striking. A secret IPX report has been retrieved. Discover the B5Books timeline, allowing you to see all their releases since the first B5 Script Book back in 2005 ! Last edited by Apsu; December 11th 18 at 22:15.